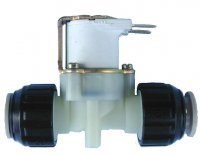 Our Bi stable latching solenoid valves are typically available in plastic with 2 way function. Latching solenoid valves utilise a semi permanent magnet latching system that can keep the bistable solenoid valve in an open position without the need for continuous electrical power supply. The latching solenoid valve can be changed from the open back to the closed position with a short DC direct current electrical pulse. For example: a typical 6 or 9 volt bi stable solenoid valve will in a closed position without electrical power. To change the solenoid valve position to the open position requires only a short millisecond electrical voltage which in turn energises the internal semi permanent magnet to open and keep open the solenoid valve without the need for additional electrical supply. To return the latching solenoid valve back to the closed position a short millisecond DC voltage needs to be applied with reversed polarity thus cancelling any magnetic force stored by the semi permanent magnet and allowing the solenoid valve to close. This is an ideal low power, energy saving and heat saving way to control a solenoid valve and is especially useful in remote areas where power is restricted to battery supply. A great example of this are public toilet cistern water refill systems and water flushing systems that can offer months sometimes years of reliable ON/OFF water control via an infra red sensor and a simple 9 volt battery. In fact this has become such a large market for energy saving devices that latching solenoid valves have been specifically designed to fit directly onto the most common 15mm copper pipe without the need for additional fittings or adaptors. (see our 1175 valves here). The other advantage of latching /bi stable solenoid valves is reduced coil heat generation. All solenoid valve coils generate heat when energised a bit like a light bulb, even a low power 6 watt light bulb or solenoid valve coil will generate heat if powered or energised for a period of time. The more powerful the coil i.e. the higher the wattage the more electrical energy is used and converted into heat. Heat generated by solenoid valves in some applications is bad news as some chemicals react to heat and for hard water areas will produce lime scale build up and cause a solenoid valve to fail. A latching or bi-stable solenoid valve coil is only energised for a very short time and is highly unlikely to become hot unless there is an electrical system failure or the wrong voltage has been applied. With this in mind and an ever growing demand for low energy and energy saving solenoid process valves, manufacturers have developed a wide range of solenoid valves to suit many different applications using this energy saving technology.